Aladdin's loyal though mischievious simian sidekick, Abu's size has served the duo well over the years, though his lust for treasure has landed them in trouble on more than one occasion. After he and Aladdin are saved outside the Cave of Wonders, Abu is on hand to trigger and help solve puzzles within the Cave itself when the party later enters it. Aladdin's pet monkey, ever mischievous, is loyal though regularly seen getting himself - and others - into trouble. 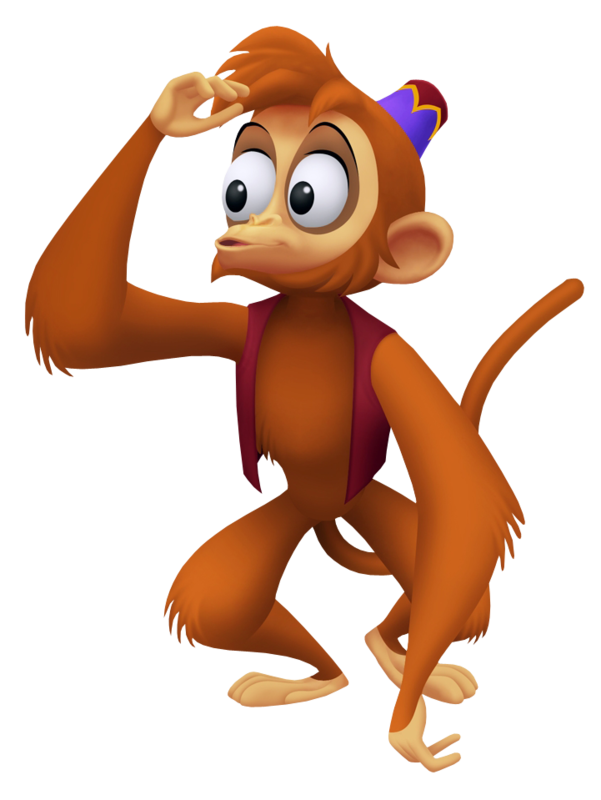 All of his appearances are at Aladdin's side, and helps the party on various occasions to solve puzzles in the Cave of Wonders. He enters into Kingdom Hearts II being chased by Aladdin, and both of them chased by the Peddler. They are forced to return the lamp, and accompanies the group in their exploration for grand treasure within the Cave of Wonders. Inside, he at one time helps solve a puzzle, and at another plunges the Treasure Chamber into darkness, pre-empting a battle with the Heartless before they may depart with their hard-earned treasure. Abu is one of the residents within Agrabah. This furry friend is found to be a bit bothersome at times, but he can have his moments. Always stirring some sort of trouble, Aladdin's monkey companion is spotted during one of Roxas's visits to Agrabah.